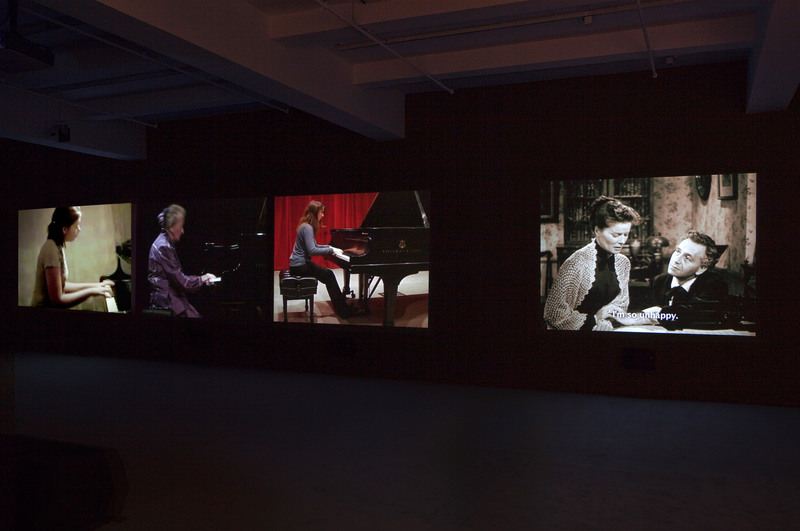 Arabesque is a four-channel video projection reflecting on the unequal legacies of two piano compositions produced by the married composers Robert and Clara Schumann (which were written for one another). Birnbaum culled performances of Robert Schumann's Arabesque Opus 18 and Clara Schumann's Romanze 1, Opus 11, from YouTube and juxtaposed these clips with still images made from footage of the 1947 film about the Schumanns, Song of Love, which tellingly features only Robert Schumann's Arabesque Opus 18. Birnbaum's evocative piece traces the lopsided reception of the two composers' masterpieces while also exploring the redistribution of Arabesque via the efforts of countless musicians to master it. "Arabesque." Take It or Leave It: Institution, Image, Ideology Digital Archive. Los Angeles: Hammer Museum, 2017. https://​hammer.ucla.edu/​take-it-or-leave-it/​art/​arabesque/​.